Roudham is a pretty, straggled hamlet within the parish of Bridgham. 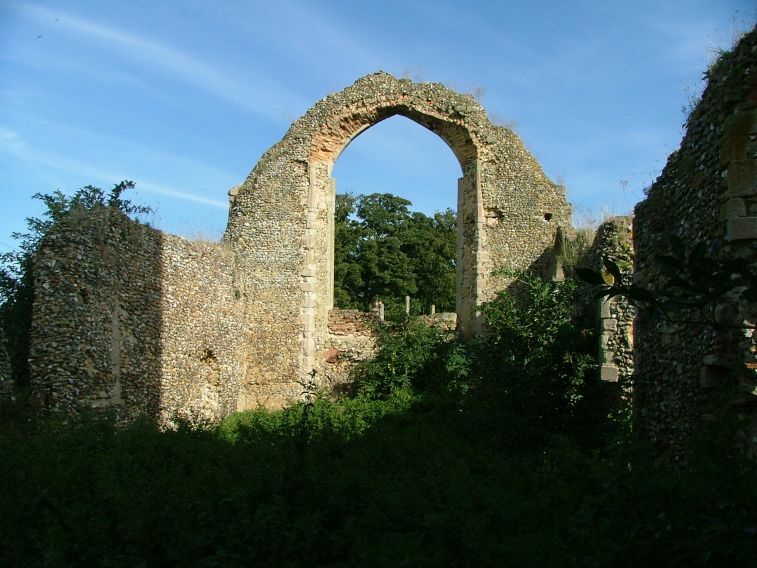 It used to have a church of its own, but it was destroyed by fire in 1736. 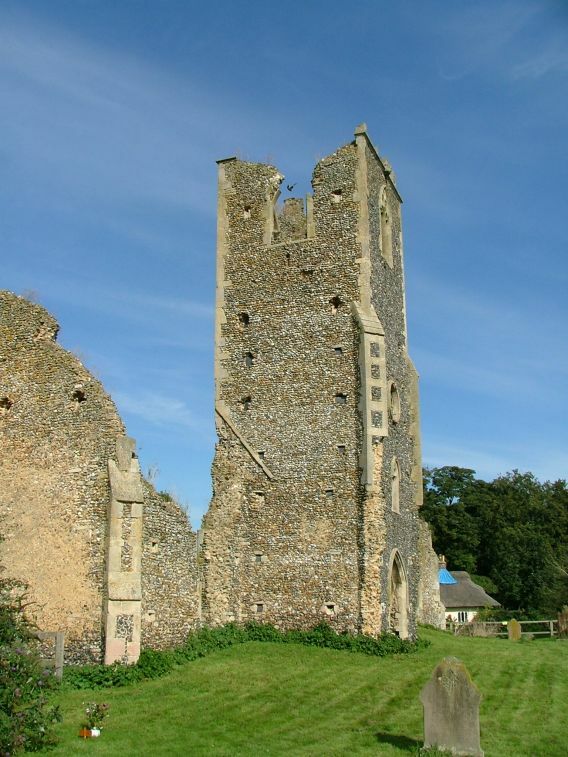 The story goes that workmen repairing the tower accidentally set fire to the thatched roof. 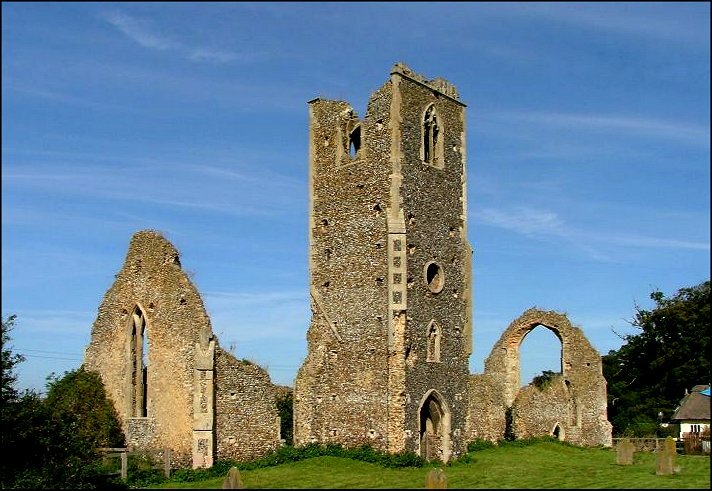 The middle years of the 18th century were not a good time to be burned down; the Church of England was going through something of a low point, and the building was abandoned. 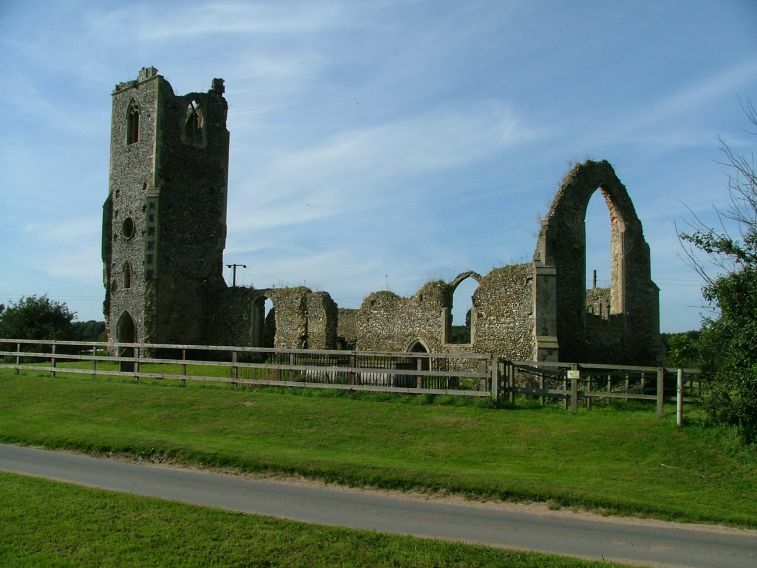 What is left to us today is a pleasing ruin, at once imposing and dignified, and carefully maintained by the local authority. Indeed, the village Millennium project was a shelter just to the west, with interesting information boards about the history of the church and of the lost village to the north. 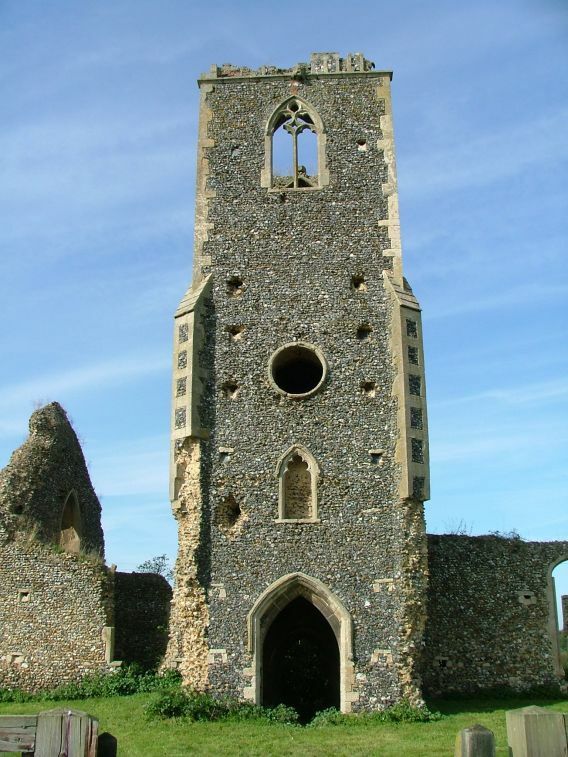 St Andrew has one of those south-west towers that form porches, and which are more common around Ipswich and to the north-west of Fakenham. It stands pretty well complete, albeit now as a hollow shell. Above the south doorway is a niche and a large round soundhole which would look good with a clock in it. The ruin looks almost exactly the same today as in Ladbroke's drawing of the early 19th century. 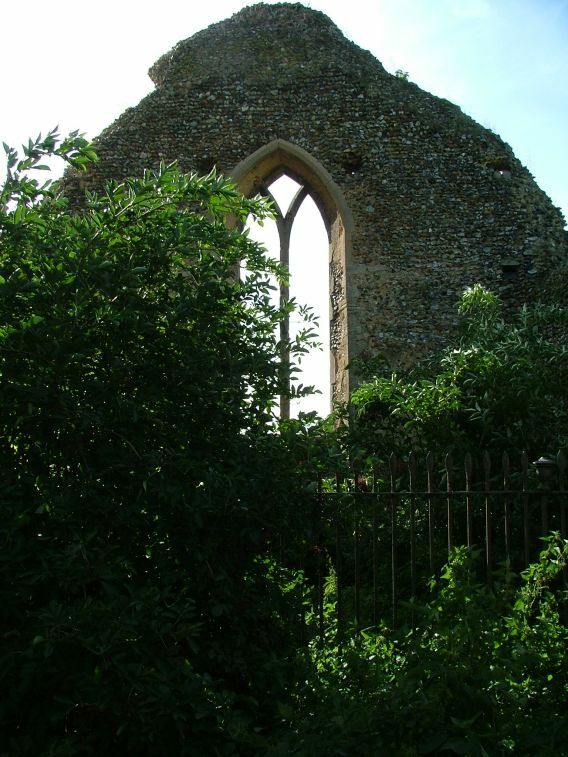 The area around the ruin is a corralled paddock, presumably so that sheep may safely graze in it, but you can walk in and approach the church. 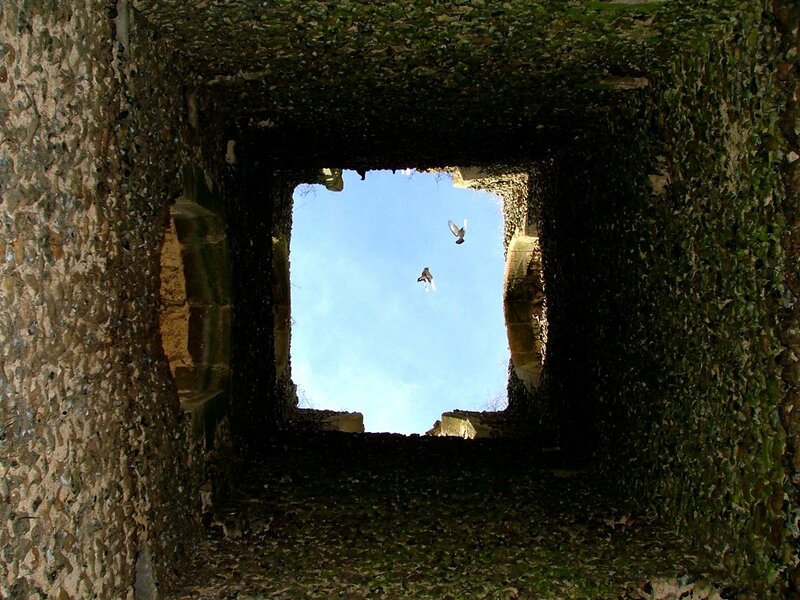 Stepping through the tower porch is a bit messy, since it not surprisingly forms a chute for pigeon droppings. 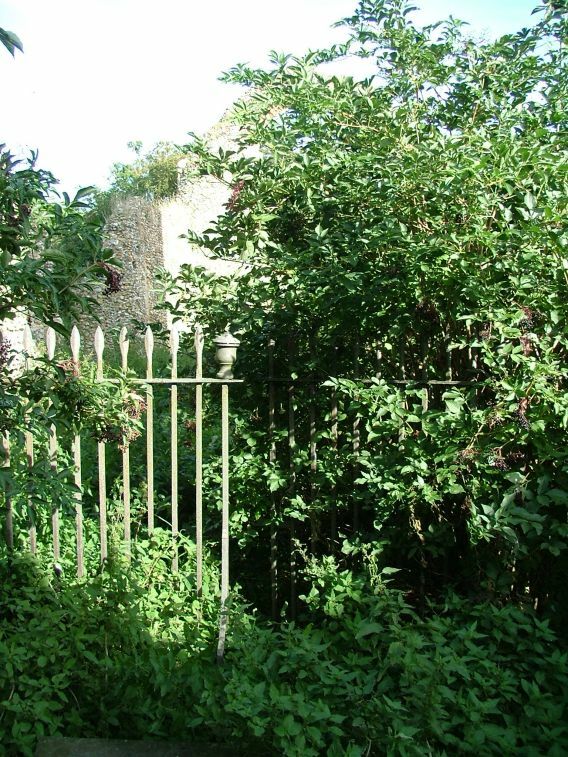 The interior was a little overgrown with nettles when we visited, but you can still see enough to get an idea of the scale of the interior, because the walls are still complete up to a certain level, and the east and west gables still contain the window arches. I don't think that there ever was a chancel arch. Even today, the graveyard is still in use, but after the fire, the shell was obviously taken over by a local family to be used as a mausoleum. The west end of the nave is cordoned off with an elegant 18th century screen, and the family ledger stones are laid as a pavement within. 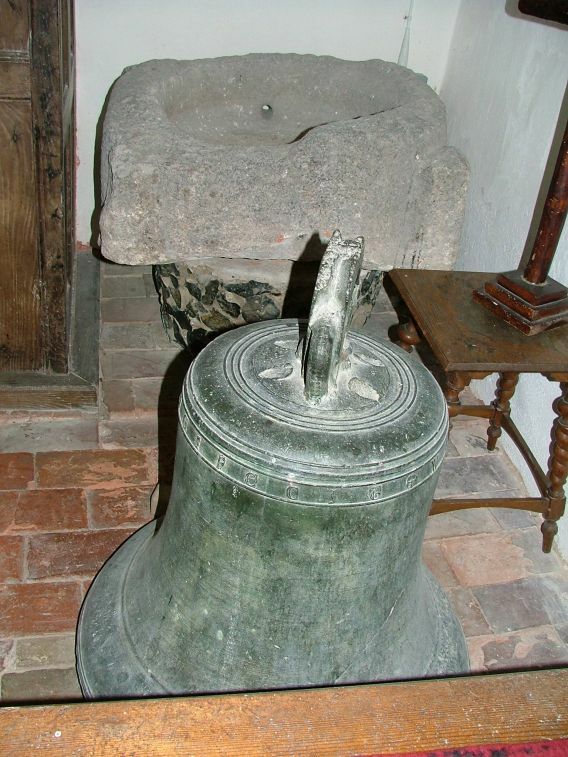 The bell from the tower now sits on the nave floor at Bridgham, along with a font which is very weathered and may well also have been brought from here. All in all, then, a satisfying place to visit, and always open. As I say, this is a pretty place, and just to the east of the ruin is a delightful thatched round house. We had come here along straggling lanes from Bridgham, but we headed back to the main road eastwards, where we met a surprisingly industrial area around Harling Road railway station; not attractive, but an undeniable part of modern Norfolk.